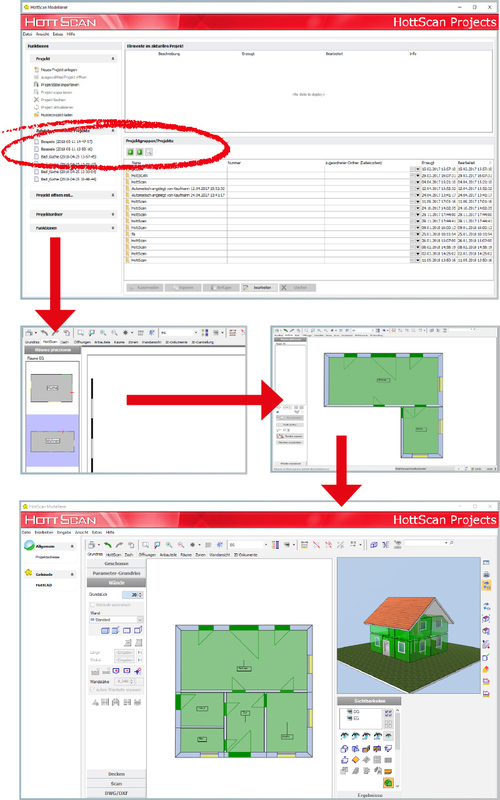 HottScan Projects assembles exported HottScan Modeler rooms to a complete building model. Rooms are placed on the floorplan with drag and drop. The user profits from the automatic room allocation function e.g. at door openings. Additional functions such as rotating and moving of 3D components walls, doors and windows are accessable. Manual and automatic wall functions enhance the construction of a complete floorplan. The building model can be adapted and used for further calculation with the technical software of HS/ETU. Detailed 2D-documents including dimensions, label and sections etc. Attention: Internal data exchange is only possible with the latest version of the particular programm. ABOUT US The HottScan GmbH based in Cologne develops and sells hard- as well as software in the field of digital 3D-roomscanning.